We’ve got some good news: After 2,5 years of heavily campaigning ESCADA finally announced to stop selling “farmed fur” products from now on. You can find all the news here. 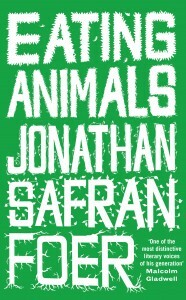 We have a brand new book in our shop: “Eating Animals” by Jonathan Safran Foer. You can find it right here. The controversial pre-trial detention for a group of 9 austrian animal rights activists has been lifted today, following an order of the appelate court in vienna, austria. Since the end of may the 9 activists (one had been released earlier) have been charged with “Forming a Criminal Organization,” under §278a StGB of the austrian penal code. The Appelate court explained that there is still a danger of commiting further crimes, but the pre-trial detention cannot be upheld if the expected penalties are in no relation to it. The second reason for detention, danger of suppression of evidence is by law limited to two months, which have long expired. The first activists have been set free already.